Granite is one of the most luxurious natural stones found in the earth. The splendor of the different colors and forms of granite slabs can seldom be matched. From time to time accidents will happen though. Heaven Sent Floor Care being a leader in the stone restoration business In Dallas, Plano and surrounding communities has performed many chip repairs on granite counter-tops to restore them to like new again.The elegance and simplicity of the granite slabs is what makes it such a popular choice for a kitchen countertop material. Although most granite manufacturers tend to maintain close quality control over the different granite slabs, since the stone is an origin of nature there are bound to be variations between different pieces. Each granite slab may contain color variations, surface marks and blemishes. The pattern and color may vary slightly within the same slab, even, though the slabs may have been cut from the same area. The variations in the granite slabs are to be expected since it is a product of nature. In fact this just makes every piece of granite countertop unique. Homeowners can rest assured that they are unlikely to go to another home and find the same color and striation of granite slab. When it comes to buying granite slabs for the kitchen countertops homeowners cannot afford to rely on small samples in the retail stores. They need to make the effort to seek out the actual shop that has the actual slabs. This will help them choose the color and slabs of granite that they want to use for the kitchen countertop. Unfortunately, there are some slabs being imported that you certainly do not want to spend your hard earned money on and be stuck with. Some granite is not true geological granite; some has been doctored with dyes and will prove to be a real problem down the road. Please contact us if we can be of any help with any of your natural stone questions. We are a proud member of the Natural Stone Restoration Alliance. 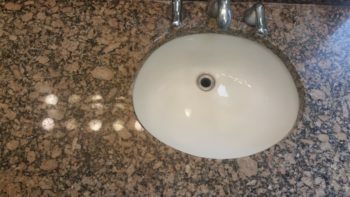 Tags: can striations in granite countertops be repaired, Granite, Granite polishing Dallas This entry was posted on Thursday, November 13th, 2008 and is filed under Granite . You can follow any responses to this entry through the RSS 2.0 feed. Both comments and pings are currently closed.